In 2011, the Washington D.C. avant rock group Beauty Pill took residence at the Black Box Theatre in the city’s multimedia art center, Artisphere, to record an album as part of a live exhibition called Immersive Ideal. The band’s processes and creative interaction opened to foot traffic, guests and curious passersby, and they used the space to record music for its first album since its 2004 debut LP, The Unsustainable Lifestyle. 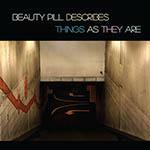 This album is Beauty Pill Describes Things As They Are, an electrifyingly poignant and personally reflective collection of songs that almost weren’t. In 2007, Chad Clark, lead creative presence behind Beauty Pill, had undergone open-heart surgery after contracting viral cardiomyopathy. His chances for survival weren’t good. As testimonial to a "second chance” or a “new lease on life,” Clark’s story does activate a host of clichés regarding the preciousness of life, the gratitude one feels at having eluded death and enlivening the need to truly seize every waking moment one has. In the album’s opening track, Drapetomania, Clark’s first line is “I want more life, fucker,” a line pulled from Blade Runner that probably means as much contextually here as it does in the film. He’s alive thanks to technology, but not at the expense of his humanity, which, in Clark’s mind, doesn’t just pertain to his own experiences. Beauty Pill Describes Things As They Are thrives because it’s more than just documentation of the biographical Near Miss Stories that Clark could very well have, and understandably so, relied upon for the bulk of this record. Instead, he treats himself as a mere touchstone and allows the creative direction of his music to illustrate the impact this illness has had on his life and outlook. Throughout most of Beauty Pill Describes Things As They Are, there’s a wealth of circuitry that designs the overall package, a surgical assembly of found sounds and electronics, conventional instrumentation and synthetic textures. Though this very clinical assessment cancels out the humanity behind Beauty Pill’s album, the influence of the electronic medium correlates directly with Clark’s recovery. In a recent interview with NPR, Clark explained that he was unable to hold a guitar following his surgery and therefore relied on his laptop to help him write and compose music, opening him up to the creative opportunities made available by technology. This direction had evidently carried over into the Immersive Ideal sessions resulting in a very rich consonance of instruments and varied electronic tones. You hear it immediately in the aforementioned Drapetomania, a jovial melody and a dose of aural sugar. The uplift from the album’s intro continues with Afrikaner Barista, one of its earliest singles. With an electrified sway comparable to Dear Science-era TV On The Radio and a glowing ensemble of brass, Beauty Pill’s construct absolutely flourishes with a pair of headphones, every musical element discernable. The strongest concentration of songs begins with Ann The Word, a song that had originally surfaced online in 2006 and marked a change in creative direction for Clark. Ann The Word details the final moments of a couple trapped in a car as it sinks into the ocean, a shamisen providing its key melody as multiple tones envelope the music like the water swallowing the car. Singer Jean Cook delivers the words with a chilling acceptance: “You and me… We’re fucked. We’re free. If we call it fate, it’s already too late.” The final moments of two drowning lovers transitions into the pensive and heavily percussive Steven & Tiwonge, which is based on a gay Malawi couple that were sentenced to 14 years in prison for violating the country’s anti-gay laws. Clark expresses nuance beautifully, juxtaposing each character with slight lyrical changes in each stanza, the same story being told from a different point of view. And then Ain’t A Jury In The World Gon’ Convict You, Baby wears a pulsing bass throb and distant string melody as it slowly bounces, a selection of percussion instruments ringing and clanging. There’s so much for the ears to find. As Beauty Pill Describes Things As They Are reaches its second half, following the tom-laden crawl of Exit Without Saving, Clark taps Arto Lindsay for The Prize, electric samba accented by lush strings, wild clarinet and acoustic elements. Acoustic instrumentation is carried with Dog With Rabbit In Mouth, Unharmed, the album’s most folk-centric offering and recent single. Harp strings are plucked and psychedelic wafts of sound grace the key melody as Cook sings, “You don’t have to look too close to see what time is doing to me.” Mortality readdressed. There’s a Caribbean feel to For Pretend, which explains method acting to children of various ages (“That woman’s an actor, sweetheart/She is only screaming for pretend/She will be okay in the end/Tears are years of practice and the blood is a synthetic blend/Just syrups dyed red/I know it’s confusing when you’re ten.”) Clark’s voice has the patient and sympathetic tone of a parent throughout, even when he becomes the actor and explains that he’s not really a recovering drug addict. (“I think that you get it, you’re fifteen.”) Ultimately, the actor’s methodology takes him over and he winds up with nothing. When Cornered is a quick and relatively violent shot of heightened tempo before Near Miss Stories, Clark’s only direct acknowledgment of his surgery: “Stethoscope on my chest, he says we’d better do this fast/One of these beats of your heart is gonna be the last.” Once again seeking resonance through nuance, he owns his good fortune by repeating “I’m so lucky.” He then turns that sentiment to you by saying “you’re so lucky” to be alive. The final track is a cover of Ann The Word by Lungfish, which has no connection to the aforementioned Beauty Pill song of the same title. The song originally appeared in Lungfish’s 1998 album, Artificial Horizon. Hearing Beauty Pill Describes Things As They Are, Clark’s story so integral to the finished product, I was reminded of Robert Wyatt, whose physical paralysis following an accidental fall forced him to rethink the music that would comprise his 1974 masterpiece, Rock Bottom. For Clark, who had already produced two EPs and an excellent full-length record, this willingness to think and compose differently due to a change in circumstance shows a need to move forward and create. The obstacles, as profound as they remain, have, once again, inspired a masterpiece. In the song The Idiot Heart, featured in Beauty Pill’s 2001 EP The Cigarette Girl From The Future, (also recently reissued by Butterscotch Records), there’s a line that says, “…The bad news is there is no hope/The good news is there never was/So it's not a question of surrender.” For Clark, surrender didn’t even seem like an option and hope, well, evidently there was some to be had after all.